Good morning, friends! The spring equinox arrives in 27 days and I, along with just about everyone else, cannot wait for the official end of winter. While I do enjoy what each season has to offer, I cannot help but be the most excited for spring. The warm weather, sunshine, pastel colors, and beautiful blooms make me incredibly happy. This mint dress with petite florals throughout not only looks like spring, but also feels like it too. The chiffon fabric feels light as air along with the flirty skirt that swishes with each step. I love a good twirl! The dress runs true to size and feels like a breath of fresh air to throw on. Good morning, friends! I’ve been a long time fan of the color pink. I use it in everything from my clothes, shoes, accessories, home decorating, stationary, kitchen appliances, and more. It’s the one color that has pretty much taken over every corner of my life. This outfit mixes a few different shades of pink with pops of leopard for a look that works for the office as well as going out for drinks afterwards. I particularly love wearing dusty rose shades in the fall and winter, including this pair of pants. The color is absolutely gorgeous. I couldn’t find the color listed online, but did find these in the store. Good morning and happy Presidents Day! I hope everyone had an amazing Valentines weekend or if you have today off, are enjoying the long weekend. I also wanted to note the passing of an icon, Lee Radziwill. Though never quite reaching the star status of her sister, Jackie Kennedy, she was a true legend in her own right. She was the definition of elegance, class, and had a timeless style that influenced many over the years. R.I.P. This was one of the outfits I styled for Valentine’s Day and it ended up being the one I wore on the actual day. Though the love filled holiday has passed, I still love this outfit for its cozy vibes and soft color combination. The pop of leopard makes a small but bold statement and the tassel earrings add an element of fun. Happy Wednesday, friends!! The forever classic brand, Dooney & Bourke recently launched a new collection called I Do By Dooney featuring pastel and metallic-colored petite crossbodies, clutches, wristlets, pouches, luggage tags, tassel charms, and card cases in a variety of fabrications from patent leathers, soft Italian leathers, and croc-embossed leathers. These are not only perfect for spring (metallics and pastels! ), but also as a beautiful Valentine’s Day gift for your loved one. The metallic one I have above combines chic functionality with a gorgeous versatile design. I’m particularly fond of an oversized clutch for everyday wear too! Good morning, friends! 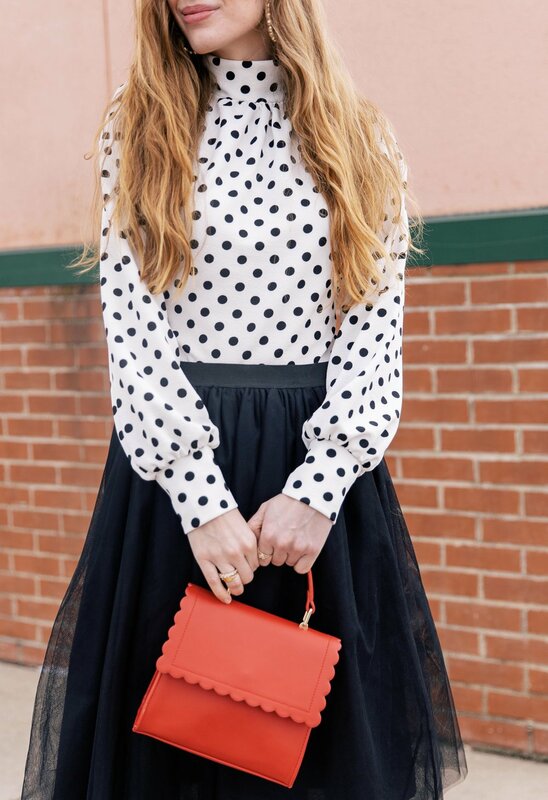 It’s no surprise that I’m a huge fan of polka dot prints. 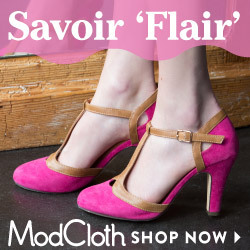 They’re not only fun and flirty, but have a vintage charm to them that I absolutely adore. This top in particular has a high neck and feels like a t-shirt, though it is a blouse. It’s has a bodysuit like construction making it perfect for tucking into skirts and jeans/pants alike. Last year I styled some polka dots with blush pinks and red. This year, I went with a high contrast look in black and white and a pop of red. A classic combo. I also styled the top with a pair of skinny jeans and red heels later in the day. Both looks are ideal for Valentine’s Day, which is right around the corner! Below are some quick snaps of the other outfit I wore. Hello to the weekend! I hope everyone is enjoying theirs so far. I wanted to do a quick post for this beyond cozy fleece top. I’ve been wearing it around the house all week long, especially with the artic air we’ve been having. It does have a crop fit making high waisted pants ideal. I’ve been pairing the top with everything from jeans, to joggers, and sleep pants. 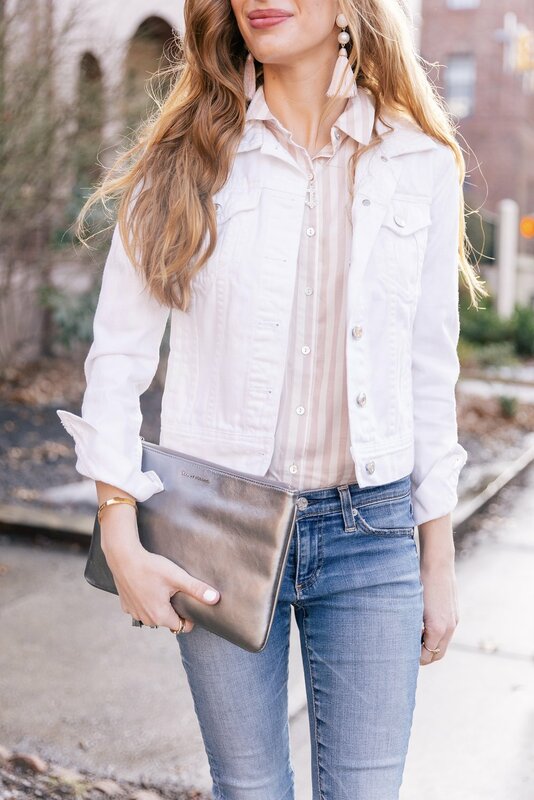 To add a bit of glam, I wore these glitter blush loafers that I am absolutely head over heels for! They fit true to size and are even more stunningly gorgeous in person. Use the code Amanda15 for 15% off of your Shein order! Happy Friday, friends! While the weather outside has been quite frightful, that doesn’t stop me from wanting to get dressed up in my go-to fit and flare dresses, especially with floral print. I honestly do not wear too much black, but love how this particular dress mixes in beautiful pink flowers to sweeten the look. The long sleeves have a little bow cinching the slight flare at the end. The neckline has some pretty ruffles as well. The dress comes with a detachable belt. There’s so many gorgeous little details that add up to one knockout piece! Happy Thursday, everyone! When in doubt, think pink! It’s often hard to feel inspired during the long winter months. The cold and dreariness start to sink in along with the never ending snow, which we are supposed to get a good deal of this weekend. My solution has always been to brighten up my wardrobe with fun colors and prints that make me smile. For me, that color is pink. It instantly puts a smile on my face and joy in my heart. This oversized sweater and plaid wool skirt from Chicwish do just the trick to not only keep me cozy and warm, but to add a good dose of happiness to my day. Both pieces make excellent choices for Valentine’s Day too! Good morning and happy new year!! It’s technically already one week into the new year, but this is my first time posting here in 2019 so cheers to all that new year has to offer. Some other big news, and the reason I’ve been a bit MIA throughout December, is that Ava and I moved! We are now officially home owners and beyond excited and thankful for this blessing. You can never go wrong with a simple jersey dress that is not only chic, but also one of the most comfortable materials to wear. To make this cold weather appropriate, I added a turtleneck sweater underneath. The black accessories balance the cheetah print out nicely. I added a bit of dazzle with the shoes and clutch having sequins because, why not?! Good morning and happy Friday, friends! This gorgeous organza dress from Chicwish is an absolute dream. One truly does feel a little bit of enchantment when wearing it. As I always say, it’s all in the details and the details on this particular dress exceed expection. The ever flattering fit-and-flare style will always be my favorite and gives a little nod to the golden age of the 1950s. The dress does have horizontal black lines, but they blend in rather well and from a distance, you can barely see them. They give the dress a demential feel. The sleeves are a sheer chiffon with pretty pink beading and a chrochet tie. Good morning, friends! As you know, mommy and me posts are my absolute favorite here on Enchanting Elegance. I get a big thrill each time I’m able to feature one. I’m particularly fond of this one because of its nautical theme, which is very close to both my and Ava’s hearts. Come sail away with us! Both the sweater and sweater dress feature a wheel motif on a hydrangea blue background. I love being able to wear this sweater with a jacket now in winter, but I can also imagine wearing it with some jeans shorts and flats or wedges in the summer too. It’s perfect for those cool summer nights. This is how you do nautical year round! Both fit true to size. I’m wearing an XS and Ava is in a size 4. Good morning and happy Monday, friends! As the weather starts to turn from chilly to downright freezing, I love to find pieces that remind me of being cuddled up in the coziest blanket. This peacoat Sherpa coat from Chicwish does just that. It has an oversized fit, perfect for layering sweaters or even another jacket under for those wind whipping days. I felt warm and toasty all weekend long while wearing this. I also thought I’d mention how the pockets are nice and roomy. It’s a small detail, but one I truly appreciated for being able to keep my hands warm and also to carry various items in them. I’m a huge fan of pockets! Good morning, everyone! As soon as I saw this dress, I immediately thought of the forever chic Kate Middleton. She will always be one of my favorite fashion inspirations and truth be told, an inspiration all around. She has a classic style and an abundance of class. This “coat dress” has the very same essence of the style we see the Duchess wear time and time again. This particular one from Chicwish has pockets, velvet trimming, a fit and flare waist, and a houndstooth print. It does fit true to size. Good morning and happy Monday, friends! One of my favorite colors to wear in winter is a bright pop of red. It’s stands out particularly well against a snowy white background and brings all the happy cheeriness along with it. This coat from Julie Brown NYC is the definition of stunning. Not only is it a gorgeous shade of red, but the arms have little bows with pearl and rhinestone buttons as well as the from buttons being the same. The sleeve length is cut at 3/4 reminding me fondly of coats worn in the 1960s with long leather gloves. I hope everyone had had a great weekend. Mine was amazing and quite a memorable one. Also, I’m sure most know by now that President George H. W. Bush had passed away. He was the first president that so remember seeing. My heartfelt condolences go out to the Bush family and their friends. From all accounts that I have heard, he truly was a great man, served his country well, and was devoted to his family. RIP 41.